In the centre of the Holland’s stunning Green Heart, discover a holiday destination unlike any other. Landal Reeuwijkse Plassen is surrounded by a blanket of wide, open fields, vast networks of waterways, traditional dutch windmills, dairy farms and large leisure lakes. If you love water, you’ll love your stay here. Modern water lodges have their own mooring jetty, so you can head out onto the lake aboard a hired dayboat. An exciting adventure island awaits any young explorers, with rope swings and zip wires to zoom through the air. While swimming pools, scenic cycle routes and stylish terrace bars provide the whole family with plenty to do. Wildlife is abundant around Landal Reeuwijkse Plassen. The crystal clear lakes are an angler’s dream. Fish from the riverbanks, or hire a sailboat and head out into the centre of the pond, where the larger fish lurk beneath the surface. The marshy grasslands that surround the park are great for birdwatching. While the countryside provides a great basecamp for bug hunting and critter finding. Just a few miles away is Gouda, a beautiful, medieval city, where much of its past can still be seen to this day. Head to the town centre for shopping and sightseeing. While its tiny backstreets, busy canals and pretty courtyards are ideal for exploring. Visit Fort Wierickerschans, a structure that - during Roman times - marked the boundary between the Roman Empire and the ‘barbarian north’. With good transport links to some of the country’s other major cities, it’s the perfect balance of quiet country living and big city light exploring. From the hustle and bustle of the city to the peace and tranquility of the lush lakelands, this is a little piece of paradise. Luxury waterside home. Ground floor: Comfortable living area, dining table and modern kitchen finished to high standards. Sauna and solarium. Stunning waterside terrace. First floor: One double. Family sized bathroom. Luxury waterside home. Large comfortable living space with dining table and modern fitted kitchen. Beautiful waterside patio. Two twin. Spacious, detached waterside villa with jetty. Ground floor: Comfortable, luxury living space with with dining area and modern fitted kitchen. WC. Terrace by the water. Private jetty. Lower ground floor: One double and one twin. Large family bathroom with bath and separate shower. Sauna and solarium combination. Spacious, detached waterside home with jetty. Ground floor: Comfortable, luxury living space with dining area and modern fitted kitchen. WC. Terrace by the water and private jetty. Lower ground floor: One double and one twin. Large family bathroom with bath and separate shower. Sauna and solarium combination. First floor: One double with ensuite shower. Spacious, detached waterside home with jetty. Ground floor: Comfortable, luxury living space with dining area and modern fitted kitchen. WC. Terrace by the water and private jetty. Lower ground floor: One double with ensuite shower and two twin. Large family bathroom. First floor: One double with ensuite shower. 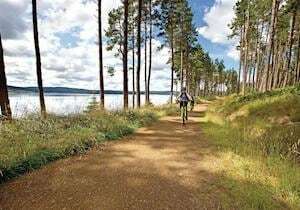 With miles of picturesque countryside to explore, whether on dramatic mountain bike routes or awe-inspiring hikes across the plateau, it’s easy to stay active at Landal Reeuwijkse Plassen. From adventure islands to swimming pools, tranquil fishing on the lake to days on the beach, you can enjoy an active break, both inside and out of the park. Enjoy a traditional taste of Holland from Landal Reeuwijkse Plassen. Take a short walk beyond the park, where the restaurant Paviljoen Reeuwijkse Hout serves up a delicious range of regional dishes. Order an organic ice cream from the park’s on-site parlour. Or come along for a quick coffee and bite to eat at the Coffee Corner Osteria. There are also various snack bars throughout the park, so you can load up on goodies for a picnic with the family. Children can spend the day helping to look after the animals on this active working farm, from feeding the ponies and goats to stroking the adorable rabbits. Pay a visit to the beautiful butterfly garden and watch the bees work as they come and go. Have a tasty treat to energise your afternoon, then blow off some steam on the playground or predict the future at the weather station. Gouda is an attractive, ancient city in South Holland, where much of its history and heritage is still largely on display to this day. Pretty courtyards, bustling canals and market stalls, as well as a network of tiny, winding backstreets make the city perfect for exploring. Enjoy a wealth of shopping opportunities, from fashion boutiques to gourmet diners in the centre of town. There’s more than enough to keep you busy for a long afternoon in this special city. Visit Fort Wierickerschans, part of the Oude Hollandse Waterlinie, that once marked the boundary between the Roman Empire and the ‘barbarian north’ in centuries past. Now fully restored, this modern structure is surrounded by an impressive moat and fortified by tall strips of trees. A true spectacle of the Netherlands, it’s a must see when visiting. You can’t visit Gouda without sampling some of their fresh-off-the-shelf treats. World-renowned for their delicious cheeses, head down to the De Graaf Dairy Farm, where you can experience a guided tour to learn what goes into making this traditional delicacy. But we all know everybody’s favourite part comes at the end – the tasting session!